Impressionism is the most famous artistic movement. But what appears today as a charming and exquisite landscape painting, was actually one of the first avant-garde movements whose members had decided to fight the values of traditional art. The impressionist outdoor paintings shocked the public by the technique used, but also by their apparent banality. As Monet, Sisley, Pissarro and many others sought to capture the ephemeral nature of light, the next generation would reject naturalism. 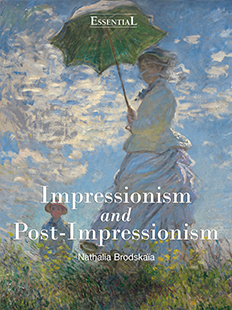 Indeed, post-impressionists such as Gauguin, Van Gogh, Cézanne and Seurat favored the subjective rather than the objective and the eternal rather than the concrete. In doing so, they laid the formal foundations of 20th-century modern art. This book is a visual guide through the crucial moments in the history of art and the progression of the 19th-century to modernity.